Planning to launch your own Southeast Asia itinerary? There’s no doubt that Thailand is sketched somewhere near the top of your list. And who could blame you? Whether you’re on the hunt for the perfect tropical beach vacation, a strong dose of history and culture, or an excuse to let loose in a frenzy that will make Las Vegas look like Disneyland, Thailand delivers. The real challenge arises when penning out what to do in Thailand. In a country as diverse—and surprisingly spread out—as Thailand, there’ll always be a trade-off. You can never expect a single trip to Southeast Asia’s most popular country to satisfy all your cravings. Not sure where to start planning out your first trip to Thailand? 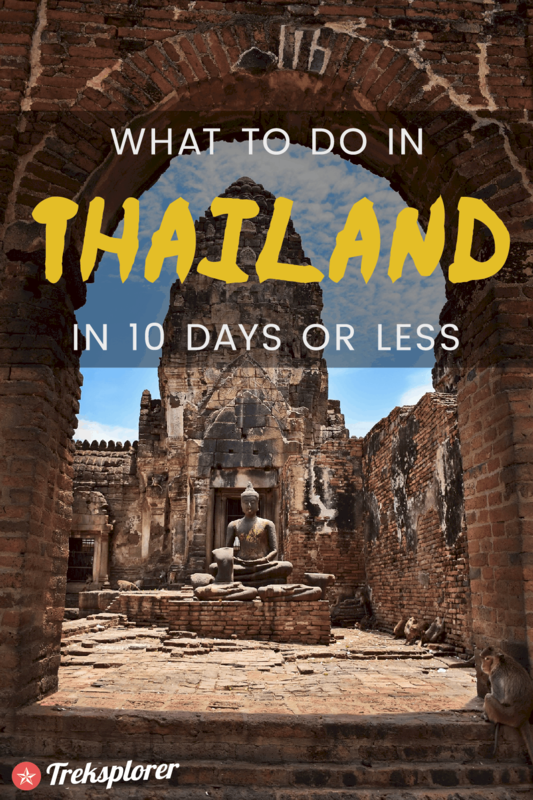 Craft the ultimate Thailand travel plan with this complete 10-day Thailand itinerary for beginners…. If there’s one thing you’ll learn while travelling in Southeast Asia it’s that the weather’s a bit unpredictable. Thailand is no different. Overall, the best time to visit Thailand is between December and March. In these months, much of the country its best weather-wise. In many of top places to visit like Bangkok, Ayutthaya & Chiang Mai, these months are the driest of the year and the most pleasant in terms of heat & humidity. Unequivocally, my answer is always the same: Yes. In fact, I’d happily place travel insurance as one of the most important purchases in your trip planning cycle! If you’re still leaning on the fence, there’s something else to consider. Recently, the Thai government has been pushing to make travel insurance mandatory for all travellers entering Thailand on tourist visa. Although the official regulation isn’t in place yet, there’s a chance it could be at some point in the very near future. In any case, for the relatively small cost of travel insurance, it’s not worth taking any undue risk. A good travel insurance policy will cover you for things like theft, lost/stolen/damaged baggage, and, perhaps most importantly, medical expenses and emergency evacuation. Even needing to make one claim will more that pay for the cost of several policies! Unlike most companies, World Nomads even allows you to purchase a policy after you’ve started your travels! Get a no-obligation travel insurance quote by clicking here. Like much of the region, you shouldn’t have much problem staying connected in most of the major destinations in Thailand. Many restaurants, cafés, shopping malls & hotels will offer free WiFi to their customers. Even better than relying on public networks, which can, frankly, be quite slow and unreliable, is to hook yourself up with an Unlimited 4G WiFi Router for Thailand. The device offers up to 4G LTE speeds across the country with the ability to connect up to 5 devices! While travelling, I always connect through a reliable virtual private network (VPN). This is especially important in a strict country like Thailand where saying the wrong thing, even accidentally and in passing, could have some serious unintended consequences. For travellers, I wholeheartedly recommend checking out NordVPN. With NordVPN’s over 5,200 servers in 62 countries, you’ll never need to stress about finding a server nearby that will ensure a fast & reliable connection. The biggest advantage of connecting through NordVPN is their military-grade double-encryption technology that makes your precious data impossible to steal. Ready to surf the Internet safer in Thailand (and around the world)? Save BIG (up to 75%) on NordVPN by checking out their multi-year plan deals! Ready to plan out your Thailand itinerary? Don’t forget the following travel essentials before you go! Guidebooks: As much I rely on technology, I rarely travel without print guidebooks. Lonely Planet Thailand provides one of the more comprehensive and up-to-date travel guides for the country. Phrasebooks: Thai isn’t so easy to speak. You could attempt to slog through with something like the Lonely Planet Thai Phrasebook & Dictionary, but a book/audio course like Teach Yourself Complete Thai will get you a lot further. Vaccinations: In addition to being up-to-date with your routine vaccinations, the CDC recommends getting vaccinations for Hepatitis A & B and typhoid for travelling to Thailand. Before I get started, I’d like to lay down a quick disclaimer. As much as I’d love to tell you that just 10 days in Thailand is enough to come to grips completely with this fascinating country, it isn’t. 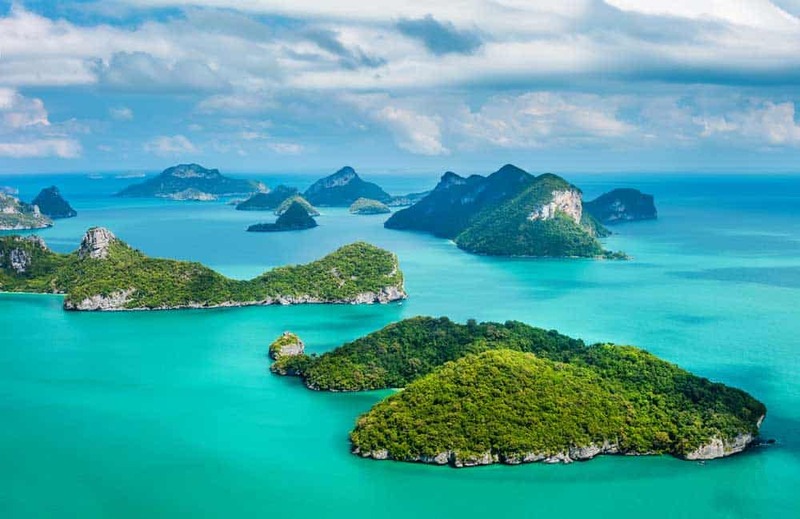 While I have no doubt that you’ll instantly fall in love with the fragrant lemongrass- and chili-tinged street food in Bangkok, the glowing golden temples of Chiang Mai, the pristine sands of Koh Lipe or the craggy karsts of Krabi, you’ll need to make some tough decisions when crafting out your Thailand travel plan. You simply can’t do it all. And, fortunately, you don’t have to. As Thailand’s become a favourite home-away-from-home among digital nomads and expats, many of the Thailand itineraries floating out in the blogosphere seem to privilege offbeat places to classic Thai destinations. Of course, there’s nothing wrong with exploring the lesser-known corners of Thailand. But with only ten days at hand (and on a first trip to Thailand to boot!) sending yourself far off-the-beaten-path just doesn’t make much sense. You’ll spend far too much time in transit and set yourself up for a heavy case of travel burnout that will, frankly, not be a welcome addition to your travels. This 10-day Thailand itinerary tries, instead, to provide a simple all-around introduction to Thailand for first-time travellers. Despite the prevailing view of the travel blogging world, you don’t need to quit your job and travel to Southeast Asia for months at a time to experience it. This travel plan is proof that you can squeeze in an unforgettable trip even when faced with a time crunch! (Although if you’ve got more time, you’d hardly do better than this 3-month Southeast Asia itinerary). Even so, you might still feel as if this Thailand itinerary moves a little fast, certainly a little faster than I normally would recommend here. If you manage to negotiate a couple extra vacation days for this trip, I’d recommend slowing down rather than adding more destinations to the mix. As tempting as it is on any trip to Southeast Asia, don’t try to throw any more countries into the mix! Unless you’re able to grab several more weeks rather than a few extra days on your vacation, it’s just simply not worth country-hopping aimlessly with limited time. The heart of the Thai nation beats in the big & brash city of Bangkok. If there’s a more polarizing Asian travel destination than Bangkok, I’ve yet to find it. 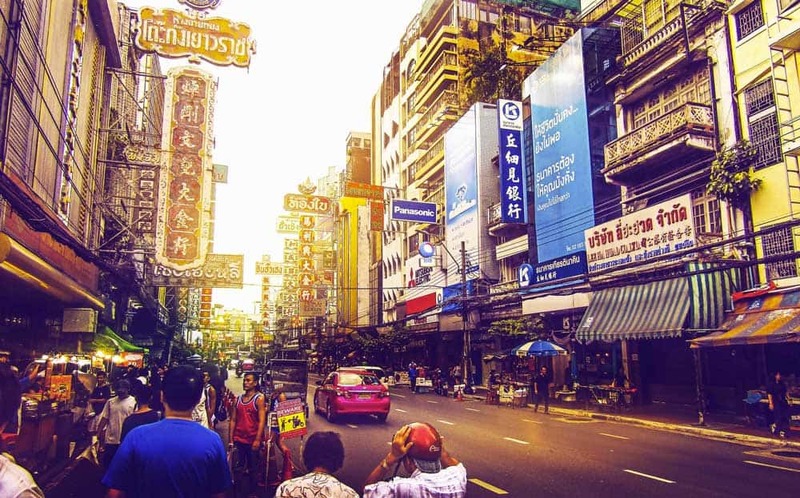 Love it or hate it though, stopping off in Bangkok is an almost obligatory part of any first-time Thailand itinerary. As far as first impressions go, there’s a good chance that Bangkok won’t give a good one. To many, Bangkok’s far more likeable after a week than a couple days. 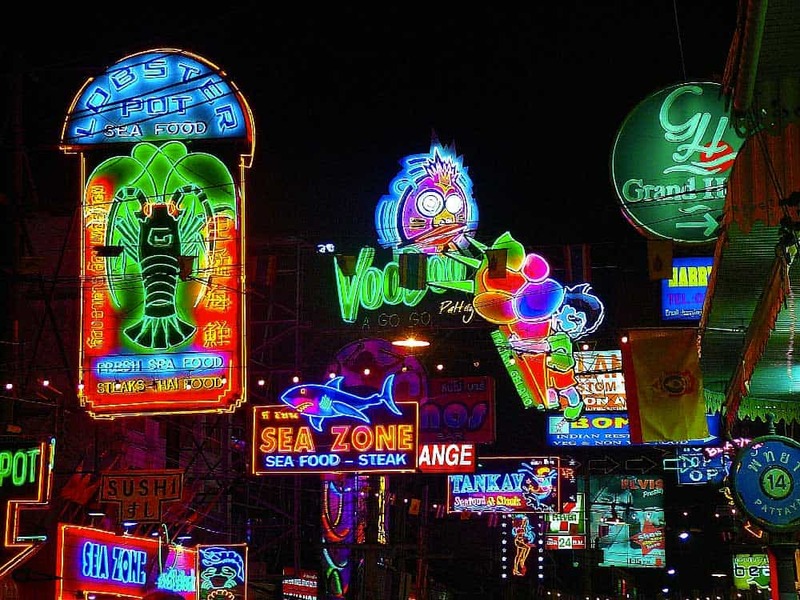 In fact, at first you might well find that Bangkok’s charms are eclipsed by its annoyances. 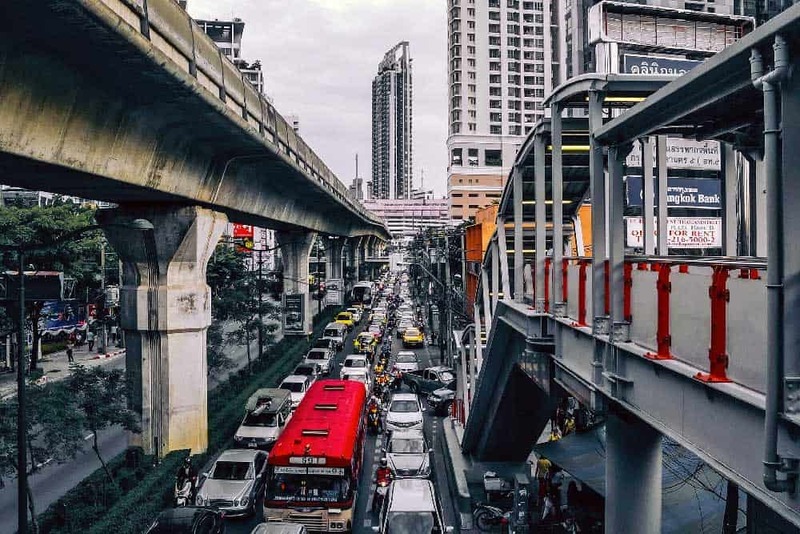 From the Thai capital’s chaotic traffic to its ongoing scams aimed at unsuspecting tourists, there’s a good chance that your first encounter with Bangkok will be fraught with difficulty. Don’t let that sway you from getting to know the city. Dig a little deeper past Bangkok’s brazen surface and you’ll find a city rife with golden temples, succulent Thai delicacies, and an energy that you just don’t find anywhere else in Thailand. Aim to stay at least two days in Bangkok. It surely won’t be enough time to fall in love with Thailand’s “City of Angels,” but it’ll be long enough to shake off your jet lag and get a small taste of the Thai delights primed to come later on in your trip. In a city the size of Bangkok, you’ll be hard-pressed to get to know the city well with just a couple days tacked on the beginning of your Thailand itinerary. 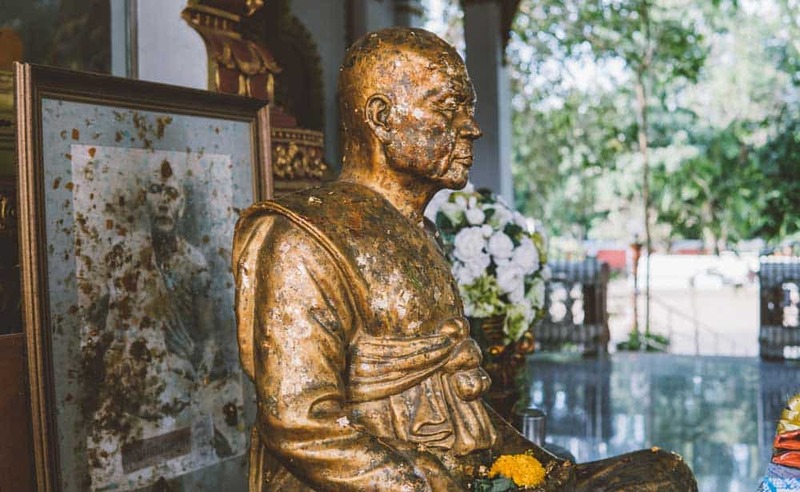 If the initial bustle of Bangkok is already clogging your senses, a day wandering around Rattanakosin, the city’s historical district, will remind you exactly why you chose to visit Thailand in the first place. There’s no better place to start exploring Rattanakosin than the Grand Palace, the official residence of the Thai royal family. Although much of the complex is closed to visitors, simply walking around and taking in the remarkable architecture of the Grand Palace is as fulfilling an experience in Bangkok as any. 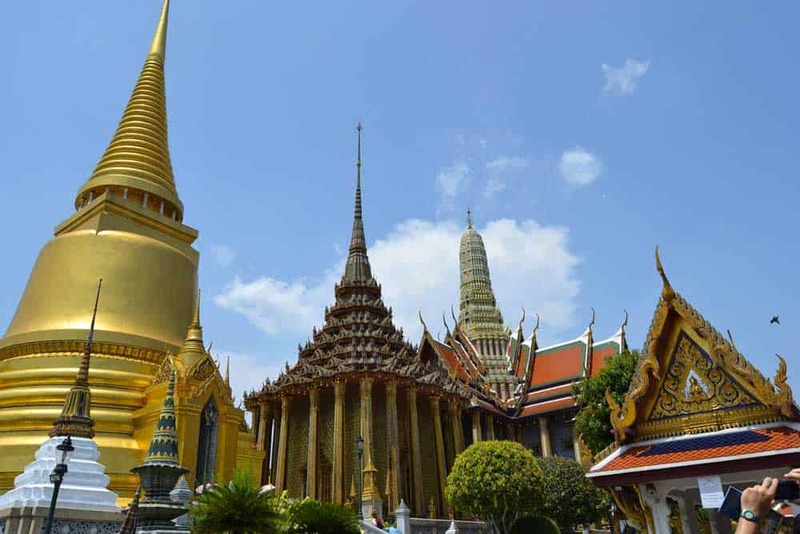 It’s possible to enter a handful of temples within the grounds of the Grand Palace including Wat Phra Kaew, the most sacred temple in Thailand that enshrines the Emerald Buddha. Also nearby is Wat Pho, the largest and oldest temple in Bangkok. Enter Wat Pho to scope out its over one thousand Buddha images and its most impressive sight, a ridiculously-large 46-metre-long golden Reclining Buddha. Even the temple grounds are impressive, featuring a number of beautiful halls and nearly a hundred stupas. Crossing over the Chao Phra River from here you’ll encounter Wat Arun, another one of the Bangkok’s star temples. 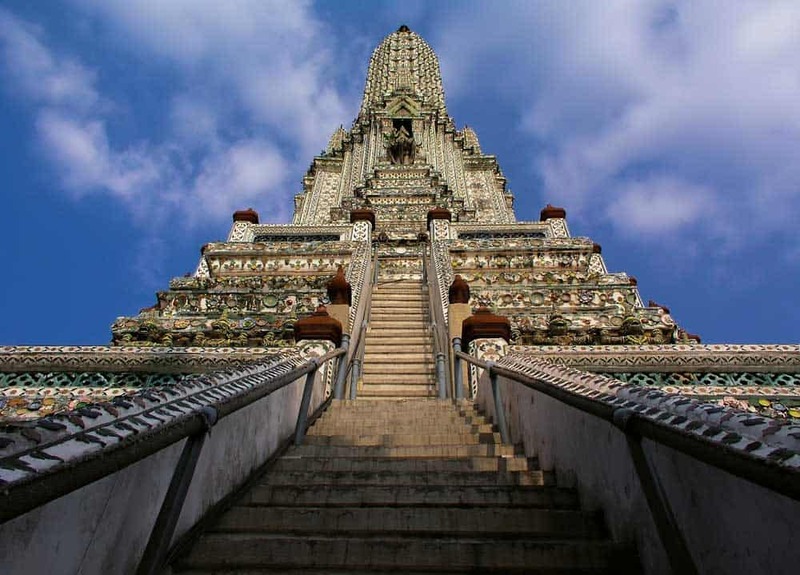 With its Khmer spires and steep-stepped façade, Wat Arun, also known as the Temple of Dawn, is truly unique for the city. Climb up the steep stairs to the side of the prang to the terrace for an incredible panorama over Bangkok. If you liked seeing the temples and palaces of Rattanakosin up close, you’ll love seeing them floating by on a Chao Phraya River cruise! Although you can hop onto a budget-friendly water taxi to troll the river by day, the Chao Phraya River truly comes to life after dark when the gentle glow of the Grand Palace and Wat Arun illuminates the night sky. Want to make the most of your evening? Book a luxurious Bangkok Dinner Cruise on the Chao Phraya River! Tour includes a Thai buffet, entertainment and pick-up from a number of Bangkok hotels. Wat Intharawihan: A temple dating back to the late-18th century, famous for its 32-metre-high gilded standing Buddha statue. Wat Traimit: An incredibly beautiful temple around Chinatown that’s justifiably famous for housing a five-and-a-half ton solid gold Buddha image, the largest of its kind in the world. Wat Saket: One of Bangkok’s oldest temples featuring an 80-metre-high “Golden Mount” topped with a massive gilded stupa. Wat Benchamabophit: A beautiful late-19th-century temple painstakingly built with Italian carrara marble and adorned with classic Thai architectural style that features multi-tiered roofs and gilded ornamentation. One of the quintessential Southeast Asian experiences is to while away a morning or afternoon in a floating market. 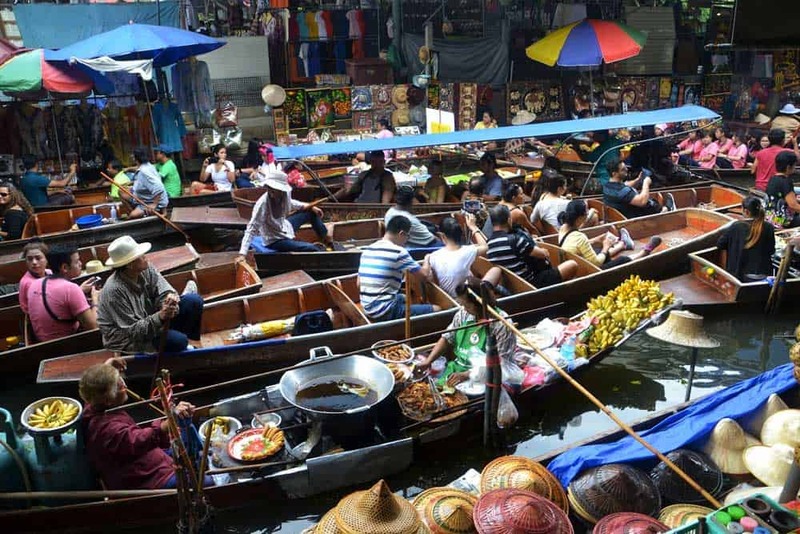 To get to the biggest and busiest Bangkok floating markets, you’ll need to trek a little further outside of the city than you might want to while visiting Bangkok on a time-crunch. Fortunately, there’s an easy alternative. The floating market duo of Khlong Lat Mayom and Thaling Chan, located just 12 kilometres from downtown Bangkok, will give you a Thai floating market experience without the hassle of travelling hours away. 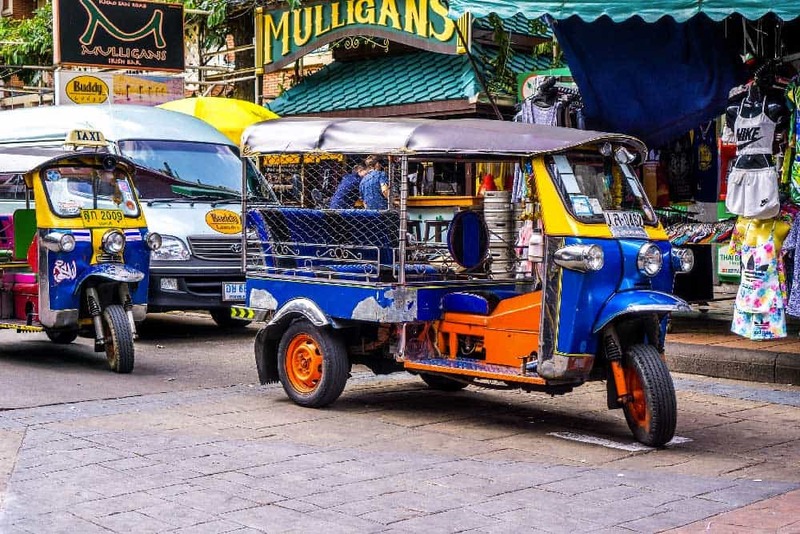 Although you’ll find much of the action takes place on land, both these markets are the perfect place to enjoy some fresh Thai food and soak in the chaos. Try to arrive earlier in the morning to avoid the mega crowds that inevitably follow. 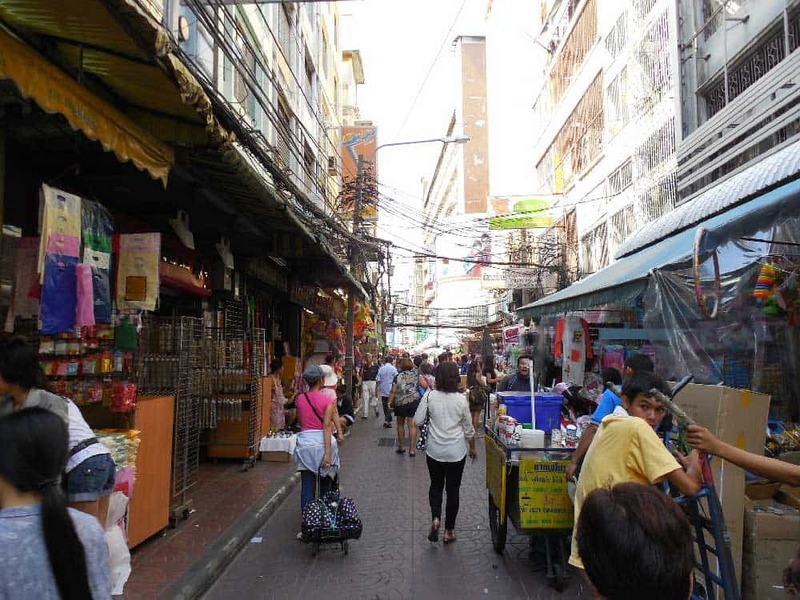 Never short on action, Chinatown is one of the most interesting corners of Bangkok to explore. Like most neighbourhoods of its kind throughout Asia, Bangkok’s Chinatown is jam-packed with shops, restaurants and street-side vendors. By day, plying the streets of Chinatown is a chaotic experience; at night, though, is when things truly come alive. It shouldn’t be surprising that Chinatown one of the best places to grab a meal in Bangkok. Of course, the selection is a little different than elsewhere in the city. Be sure to scale along the busy Yaowarat Road to sample some of Chinatown’s culinary delights whether its oyster omelettes, dim sum or coconut ice cream. As much as I hesitate to recommend it, I’d be doing the independent travel world a slight disservice if I didn’t at least mention Khao San Road. 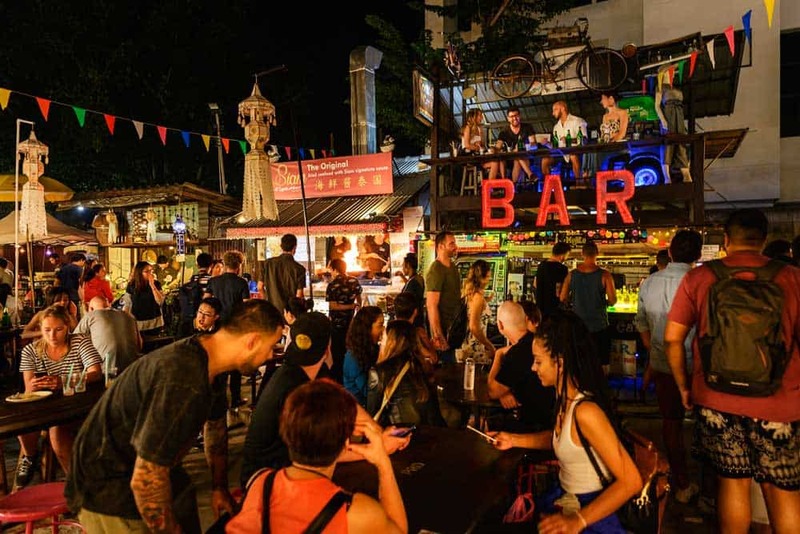 This infamous stretch of bars, restaurants, food carts, and shops in Bangkok is one of the most famous backpacker hangouts in the entire world. Even if taking in the full Khao San Road experience isn’t your style (I know it’s not mine anymore), there’s no doubt that you’ll find something compelling along this strip. If it’s your first time in Bangkok, the tamed-down street-side snacks here are a delicious introduction to Thai cuisine that won’t completely shock the palate. It’s hardly surprising that with the massive size and sprawl of Thailand’s “City of Angels,” choosing where to stay in Bangkok can be a challenge! Accommodations in Bangkok range from the cheapest backpacker joints to some of the top luxury hotels in the country. The Printing House Poshtel: An ultra-stylish, centrally-located hostel that’s a step above most in the budget price range. Both dorms and private rooms with private bathrooms are offered. Norn Yaowarat Hotel: A spotlessly clean and comfortable 3-star hotel located in the heart of Chinatown. A mix of both private rooms with balconies and dormitories ensure options for every sort of traveller. Riva Arun Bangkok: A delightful and modern 4-star hotel set on a stunning riverside location. The evening views overlooking Wat Arun across the Chao Phraya from the open-air restaurant are simply divine. The Peninsula Bangkok: The most luxurious accommodations in experience in Bangkok. Set upon the banks of the Chao Phraya, this 5-star hotel features incredible vistas onto the modern city skyline. Cool down in the graceful outdoor pool or chow down on authentic Thai food at the Thiptara Restaurant to squeeze the most out of your stay here. By air: It’s no surprise that Bangkok Suvarnabhumi International Airport (BKK) is the biggest and busiest airport in Thailand. Bangkok is a major hub for several airlines including Thai Airways, Jet Asia Airways, and Bangkok Airways. You should have no problem finding flights to Bangkok from most major international gateways. Looking for cheap flights to Bangkok? I’d recommend searching for airfare deals on CheapOair! I’ve had a lot of luck lately finding SUPERB flight deals here, even compared to other more popular flight engines like Skyscanner or Kayak. Although it’s only a short 80-kilometre jaunt from the capital, Ayutthaya can feel worlds away from the modern bustle of Bangkok. Founded in 1350, Ayutthaya was for over 400 years the royal capital of the Kingdom of Siam. That history was hardly lost on Ayutthaya. Today, Ayutthaya is one of the best places to visit in Thailand and is renowned for its old city ruins that feature ancient temples, palaces, and statues. On this 10-day Thailand itinerary, try to spend at least one day in Ayutthaya. Although it might feel a little rushed, it certainly won’t be a day you’ll soon forget! The biggest challenge in visiting Ayutthaya isn’t figuring out what to do, but finding a way to fit it all in! On a time-crunched itinerary, you’ll simply skim the surface of all the best things to do in Ayutthaya. With only one day in Ayutthaya, you’ll spend the bulk of it scouring through the mystical ruins of Ayutthaya Historical Park. This UNESCO World Heritage Site is more than just your run-of-the-mill temple complex; it’s perhaps even one of the best places to visit in Southeast Asia! Wat Chaiwatthanaram: A former royal temple dating back to the 17th century. The temple’s design takes a card from the Khmer playbook, bearing similarities to the grand Angkor Wat in Cambodia. Over a hundred Buddha statues pepper the area around Wat Chaiwatthanaram. Wat Phanan Choeng: A beautiful 14th century temple built on the banks of the Pa Sak River. The temple’s imposing 19-metre-high Buddha is one of the most famous and sacred images in Thailand. Wat Lokaya Sutha: A restored monastery ruin that’s home to an enormous 42-metre-long reclining Buddha statue draped in an bright orange cloth. Wat Phra Sri Sanphet: The most important former royal temple in Ayutthaya dating back to the mid-15th century. Features three stupas, the only remnants of the original temple that the Burmese destroyed in 1767. Wat Mahathat: A large royal monastery that was originally built in the late-14th century. The ground contain one of the most famous images in Ayutthaya, a stone Buddha head entangled within the roots of a tree. Ban Boonchu: A small budget guesthouse with a delightful homey atmosphere. Many of the biggest attractions of Ayutthaya lie within walking distance. Baan Tye Wang Guesthouse: A lovely 3-star boutique guesthouse set in tranquil garden. Chilling out on the private balconies that overlook the gardens and canals is the perfect way to end a long day of sightseeing. Baan Thai House: A 3-star resort-style property offering beautiful Thai villas and bungalows in a placid garden setting. Cooling down in the outdoor pool or relaxing on your balcony with a Singha will recharge your batteries after tackling Ayutthaya to its fullest. Sala Ayutthaya: A stylish boutique hotel boasting a minimalist modern design that sets it apart in Ayutthaya. The river and temple views from the on-site restaurant or your room’s private balcony are simply stunning! By train: There are regular trains from Bangkok to Ayutthaya departing from Bangkok Hualamphong. Trains take between 1.5 and 2 hours and cost between 15 and 66 baht depending on the ticket class. By bus: Buses to Ayutthaya depart from the Mo Chit Bus Terminal in northern Bangkok. The trip to Ayutthaya (60 baht) should take you anywhere from 1.5 to 2 hours depending on the traffic. By taxi: If you’re a little less adventurous with your transportation choices and want a quicker more comfortable route to Ayutthaya, you can opt for a metered taxi. Expect the approximately 1.5-hour journey from central Bangkok to cost around 1,400 baht ($44). 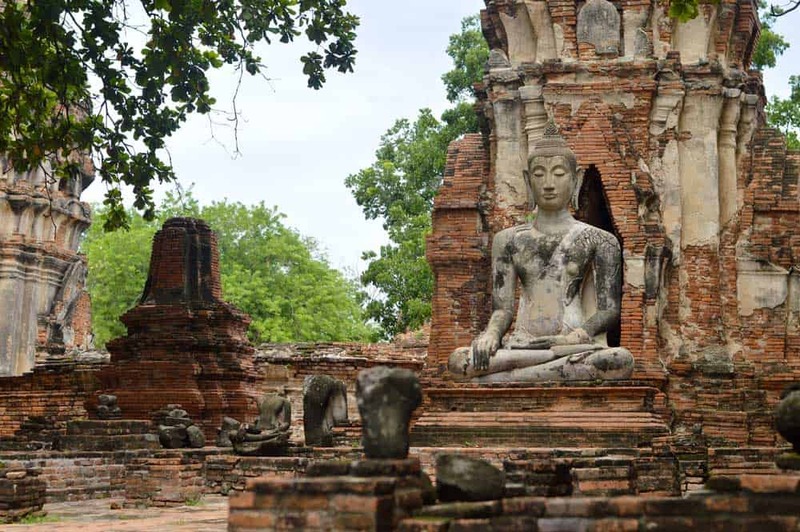 Like Ayutthaya, Sukhothai glimpses deeply into Thailand’s past. For two centuries, just before Ayutthaya, Sukhothai held the royal seat of Siam. 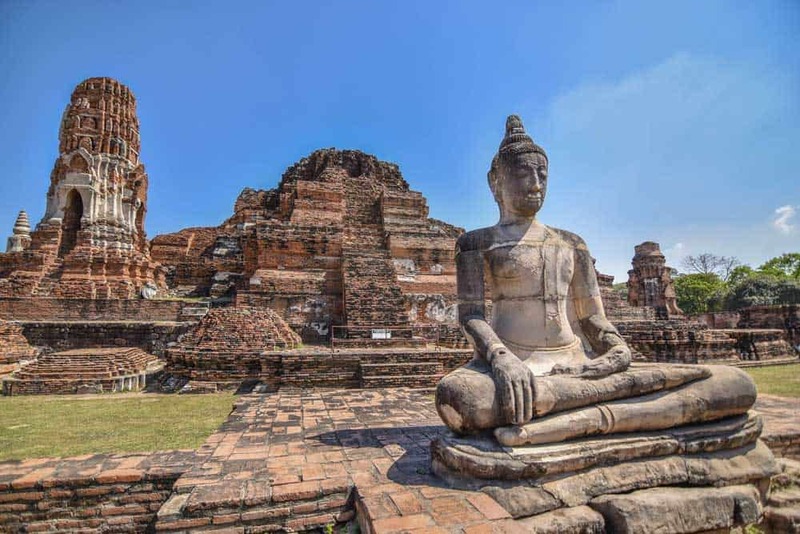 In fact, much of the modern Thai culture—whether it’s the country’s architectural legacy, arts or language—traces its roots back to the Sukhothai Kingdom. What you’ll find in this small city, located over 400 kilometres from Bangkok, is a more relaxing cultural experience than the busier and more accessible Ayutthaya to the south. Give yourself at least one day in Sukhothai to take in the main sights. It’ll be a bit rushed, no doubt, but it’ll afford you an extra day to relax later on in this Thailand itinerary. Just as in Ayutthaya, with only a day in Sukhothai you’ll have to ratchet down your travel plans. 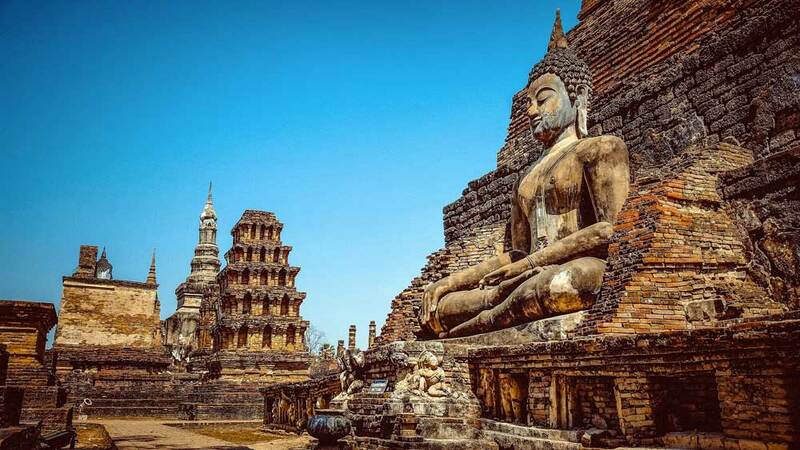 There’s a ton of things to do in Sukhothai; you’ll simply need to accept that you won’t get to all of them on a time-crunch. With limited time, you’d do best to focus your efforts on Sukhothai Historical Park. 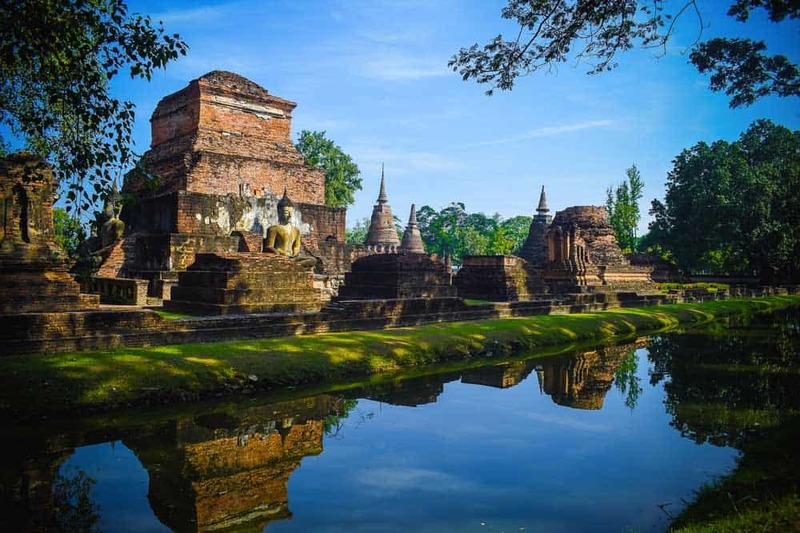 This UNESCO World Heritage Site occupies the ex-site of Old Sukhothai, the former royal capital of Siam. Wat Mahathat: A late-13th century temple that’s the most important in Sukhothai. This temple is unique for its array of Lanna, Singhalese, Sukhothai and Mon Hariphunchai architectural styles. 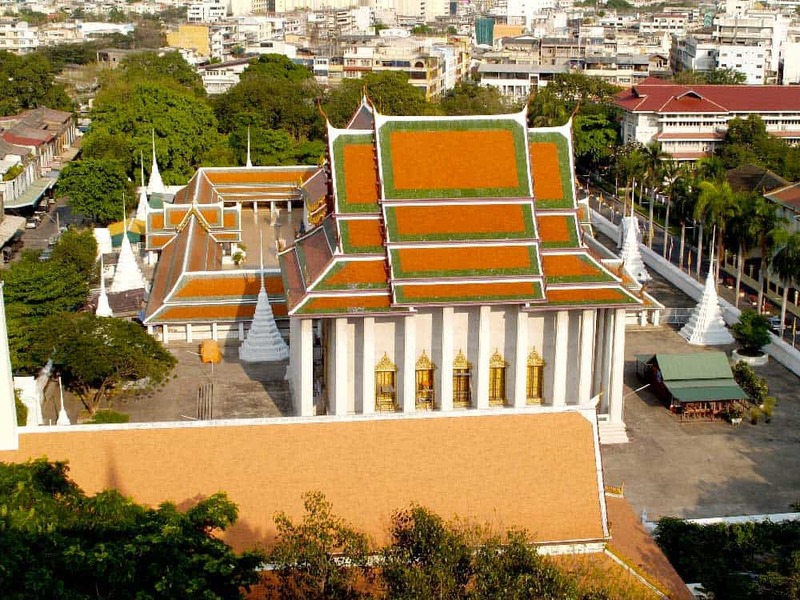 Ramkhamhaeng National Museum: A branch of the National Museum of Thailand where you’ll find over 2,000 ancient artefacts from Sukhothai and the surrounding area. Wat Si Sawai: One of the oldest temples in the area, dating back to the pre-Sukhothai era. The three prangs, built in Khmer style, are quite stunning in their appearance. Vieng Tawan Sukhothai Guesthouse: A budget guesthouse that punches well above its weight in value. Rooms are clean and decked out with flashes of both modernity and classic Thai charm. The outdoor pool is, as always in balmy Thailand, as welcome addition. Sawasdee Sukhothai Resort: A 3-star resort featuring bungalows simply oozing with traditional Thai style and grace. With an outdoor pool and children’s playground offered along with family bungalows, this is the perfect place in Sukhothai to stay with the kids. Sriwilai Sukhothai: The most luxurious hotel in Sukhothai. Rooms here are well-appointed with both modern and regal Southeast Asia design elements. Delectable evening views of the lush countryside and Wat Chedi Sung from the outdoor pool are worth the stay alone. By train: There are no direct trains between Ayutthaya and Sukhothai. To travel between the two cities, you’ll need to take a train from Ayutthaya to Phitsanulok where you’ll need to catch an onward bus to Sukhothai (1 hour). By bus: There are regular buses from Ayutthaya to Sukhothai. The journey takes about 6 hours and will cost about 310 baht. Far more loveable than Bangkok, Chiang Mai charms travellers like no other city in Thailand. It’s become not only a solid staple on the Thailand backpacking circuit, but a favourite temporary home for expats roaming through. Even if Chiang Mai shedded some of its hundreds of temples, it would still be a wonderful city to relax and soak up Thai culture. Here you’ll find not just some of the best sites in northern Thailand, but some of its best food. This is a city where you’ll never go hungry and where your tastebuds will never stop exploring. Carve out at least two days in Chiang Mai on your Thailand itinerary, more time if you have it. Chiang Mai is a city where you’ll never feel bad lingering. In fact, after visiting for the first time, you might just find yourself doing just that. From its impossibly beautiful surroundings to its architectural brilliance, there’s a never-ending list of amazing things to do in Chiang Mai. Much of the city’s typical tourist points of interest radiate in and around its Old City. 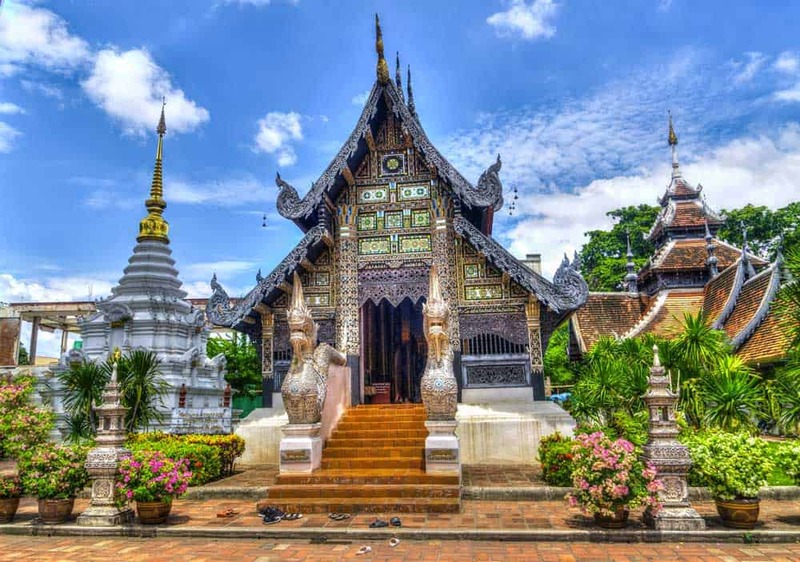 You’ll want to spend a sizeable chunk of your two days in Chiang Mai exploring the temples, backalleys, and food stalls of the Old City. Of course, there’s a whole world just outside the city waiting to be discovered. Venture away from the city centre and you’ll find yourself immersed in misty mountains punctuated by rainforests, rivers, and waterfalls. There’s no better way to launch your Chiang Mai itinerary than exploring its Old City. Home to dozens of temples and some of the tastiest food in Thailand, spending time here is never a waste. Wat Chiang Man: The oldest temple in Chiang Mai dating back to the late-13th century. Most impressive in this temple is the chedi, ornamented in a mix of Lanna and Singhalese style with 15 carved elephants and a gilded top, and the three-tiered Lanna-style viharn. Wat Chedi Luang: Duly named “The Temple of the Great Stupa,” this beautiful temple is famous for its towering chedi. Although much of the chedi was destroyed in an earthquake, its massive scale still impresses. Wat Phra Singh: A magnificent 14th-century temple featuring a striking Lanna-style viharn that’s as impressive inside as out. Unless you’ve been living under a total social media blackout (and would that really be such a bad thing? ), you’re probably aware of the dangers of animal tourism. Fortunately, the Elephant Nature Park isn’t one of those offenders. In fact, it’s quite the opposite! The elephants here aren’t forced to do anything out-of-the-ordinary. No tricks. No riding. Instead, what you’ll see at the Elephant Nature Park are these gentle giants in their natural habitat. By visiting, you’ll have a chance to interact closely with them including feeding them food, preparing their medication, and bathing them. The experience doesn’t come cheap, but unlike many of the outfits around Thailand, you’ll know that your dollars will be going to help a good cause. 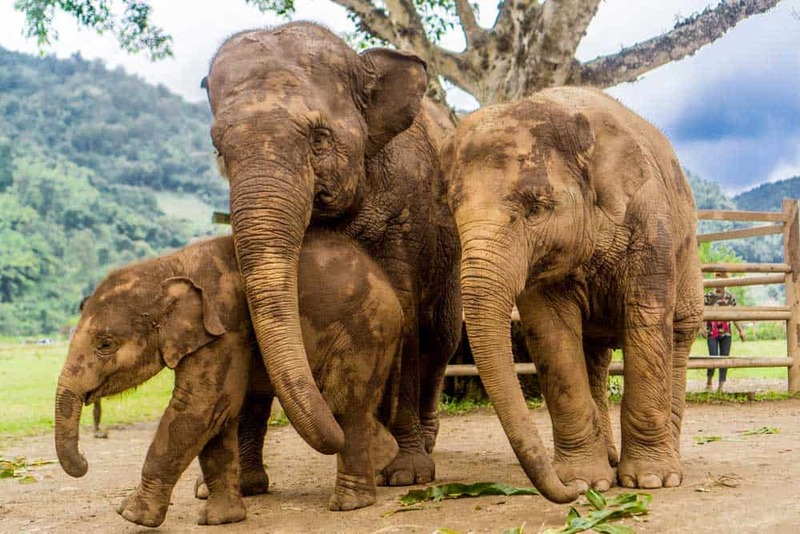 As the Elephant Nature Park lies outside of the city, you’ll need to dedicate an entire day to it if you choose to go. If you’ve yet to find yourself drowning in an Asian night market, there’s no better place to start than at the Chiang Mai Night Bazaar. As expected from a market of this ilk, the Chiang Mai Night Bazaar is a cocktail of cheap souvenirs, knick-knacks, clothing, and household items. Although the night bazaar is a great place to perfect your bargaining skills, it’s also a fantastic opportunity to test your tastebuds. Dip into the Kalare Food Center, across the street from the Chiang Mai Night Bazaar, to try out an array of Thai and Asian cuisine that will knock your socks off. As one of the most popular places to visit in Thailand, there’s hardly any shortage of choice in Chiang Mai. If you’re debating where to stay in Chiang Mai when you’re crunched for time, the answer is pretty simple: the Old City. De Klang Vieng: A beautiful new budget guesthouse located close to several top Chiang Mai attractions. Rooms include a balcony for your relaxation. Green Tiger Vegetarian House: A remarkably comfortable 3-star inn that’s close to all the action. You’ll simply cherish the amazing views from the fourth-floor vegetarian restaurant. Thai Akara Lanna Boutique Hotel: An impeccable 4-star boutique hotel in the heart of the Old City. Luxurious touches are sprinkled throughout, from the rich room furnishings to the well-manicured garden and outdoor pool area. Pingviman Hotel: A distinctively Thai resort featuring striking classic Southeast Asian design inside and out. The outdoor pool area is the perfect place to lounge after a long day of temple-hopping. By bus: The quickest and most convenient option for travelling between Sukhothai and Chiang Mai is by bus. Buses depart several times a day from both the Sukhothai Bus Terminal and the Historical Park. Between the two cities the fastest (and coincidentally the cheapest) buses take about 5 hours and 30 minutes and cost 207 baht. Coming from the hectic & congested streets of the mainland, the gentle seabreeze of Koh Samui, Thailand’s most popular luxury island getaway, will be instantly soothing for your traveller lungs. 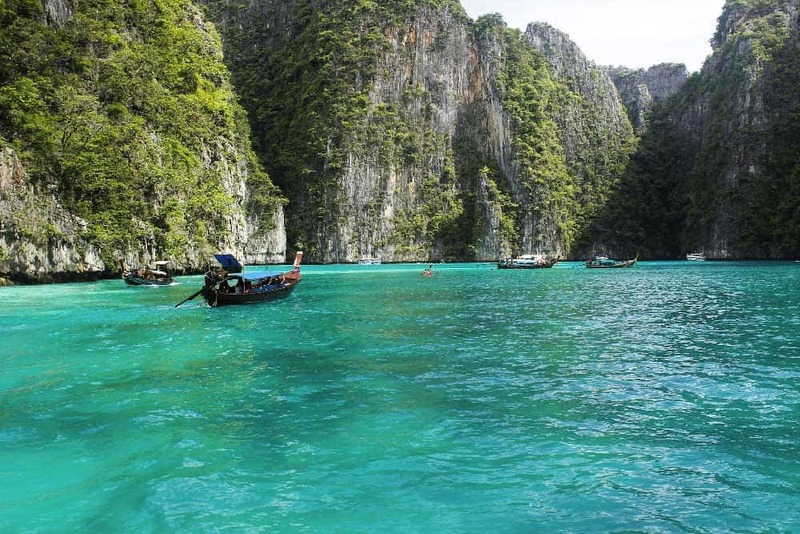 One of the things you might not know about Thailand is that it’s home to about 1,430 islands. Many would argue that in that massive cohort, there are far better islands in Thailand to visit than Koh Samui. And while they’re not necessarily wrong, there are plenty of reasons that Koh Samui sees all the action it does. 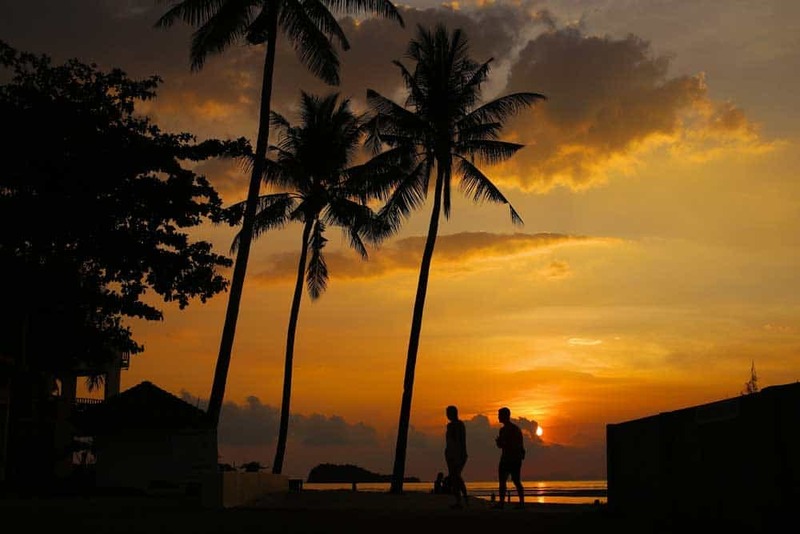 Thailand’s second biggest island sports well-developed tourism infrastructure and is more easily accessible than many of the other lesser-known islands that hang out among the best islands in Thailand. Since we’ve been serious on the move with this 10-day Thailand itinerary, I’d recommend giving yourself at least 3 days in Koh Samui. This little bout of relaxation is the perfect way to end your Thailand vacation and get your body rested for the long trip back home or to your next destination. It seems a shame to burden you with a list of things to do in Koh Samui when, truthfully, the best way to spend your time here might be doing nothing at all. Your first order of business in Koh Samui should be to unwind after a long week of sightseeing in mainland Thailand. The island is justifying famous for its beaches. And even with the influx of travellers making their way to its shores, Koh Samui has some prizes in store. 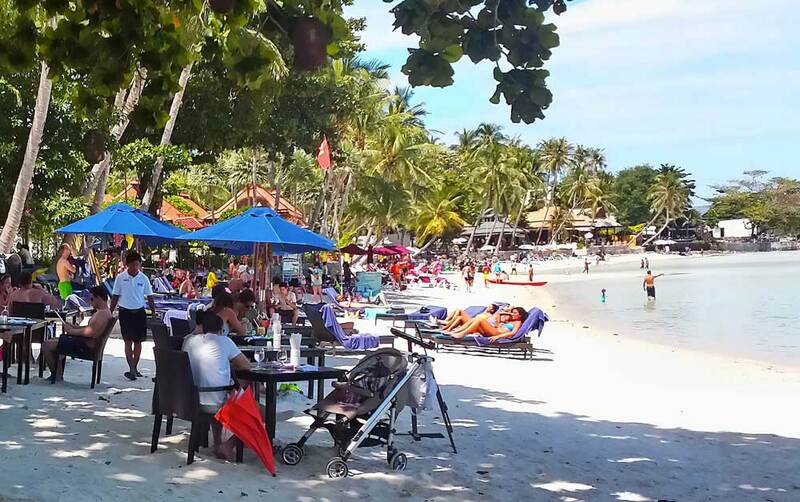 Most renowned is Chaweng Beach, a beautiful, but busy, white sand beach on the east coast of Koh Samui. Its popularity has sprouted a slew of accommodations, dining, entertainment, and nightlife options. Visit Chaweng Beach in the early morning hour to catch a sunrise that will be the highlight of your stay in Koh Samui. 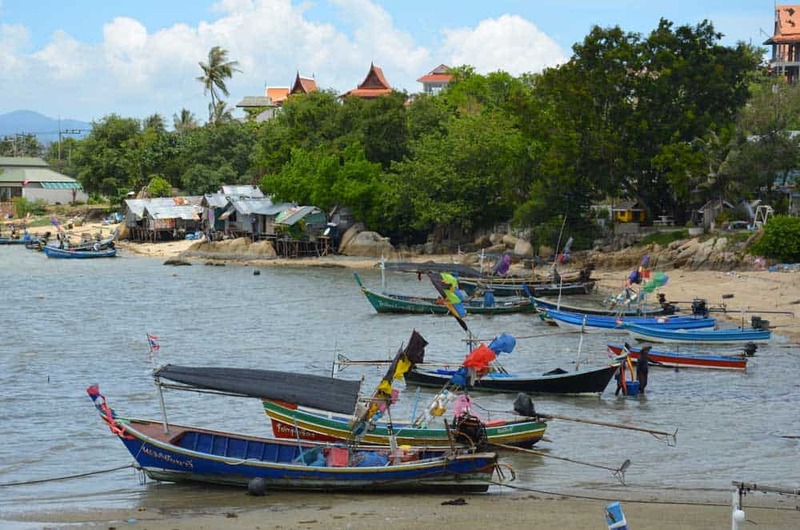 If the crowds and debauchery of Chaweng don’t tickle your fancy, you’ll might find other spots like the more subdued Bophut Beach & its Fisherman’s Village or the chilled-out Mae Nam Beach more to your liking. One of the quirkier places to visit on Koh Samui is the Secret Buddha Garden. Set upon one of the highest mountains, the Secret Buddha Garden features a slew of unique hand-carved statues reflecting Buddhist themes. 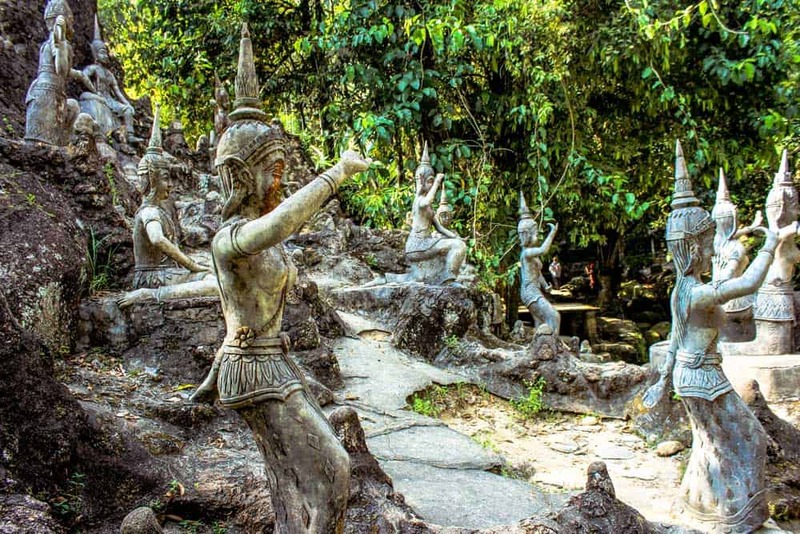 The statues are scattered among the grounds of a former durian fruit farm, some delicately arranged to speak of myths and legends while others lie hidden among the thick greenery. Visiting the private garden is only half the fun in the trip to the Secret Buddha Garden. Stalking out the beautiful surroundings—mingling lush junglescapes with waterfalls and streams—and grabbing a gander of at the stunning vistas along the way is worth the trip alone. It’s not often you get to see a mummy outside of an Egyptian museum or a cheesy Hollywood flick. Much less a mummy monk. 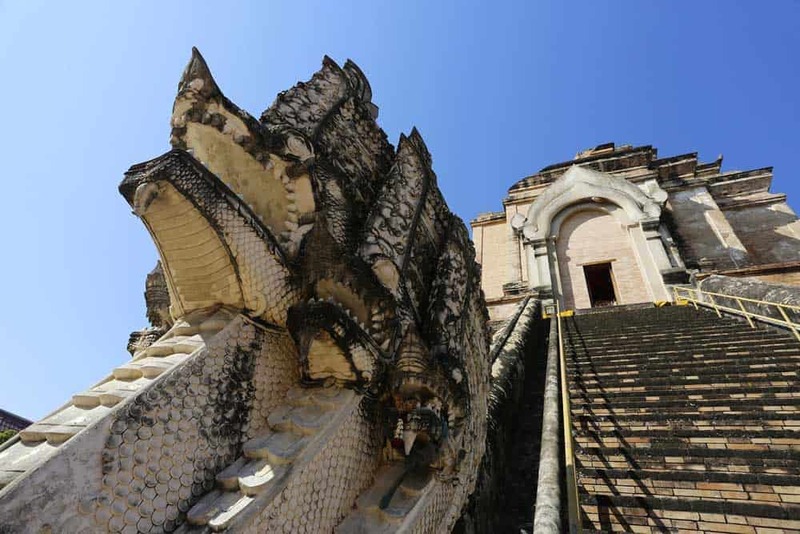 At Wat Khunaram in Koh Samui you’ll see just that. And it may, in fact, be just as weird as you expect. Wat Khunaram enshrines one of the oddest things you’ll ever see in a Buddhist temple: the mummified remains of Luong Pordaeng, a monk who supposedly died while meditating. Although Pordaeng died over 40 years ago, his body is remarkably well-preserved with the exception of his eyes, which are, oddly enough, now hidden by knock-off Ray Bans. Not that there isn’t enough to keep you busy on Koh Samui, but if you’re looking for something a little different, there’s perhaps no better day trip than to the beautiful Ang Thong Marine National Park. Over 40 islands, set among more than 100 square kilometres of seemingly virgin seas, await to transport you to a tropical paradise that you’d always dreamed of. On the islands, lush jungles cling to limestone karsts and hide waterfalls, lakes, coves, and pristine white-sand beaches. Even the seas around Ang Thong Marine National Park are an attraction of their own, perfect for scoping out exotic marine life while sea kayaking, diving or snorkelling. Ang Thong National Park is open all-year-round with the exception of November and December when the monsoon season roars in. The insane popularity of Koh Samui has led to an explosion of accommodations options over the years. Although Thailand’s second biggest island is known for its luxury selection, picking out where to stay in Koh Samui doesn’t necessarily lead to a shattered travel budget. Villa Giacomelli: A small friendly guesthouse within a 2-minute walk of the beach in quiet Taling Ngam. The ridiculously budget-friendly rooms are all equipped with garden-view terraces. Buri Rasa Village: A lovely 4-star resort in Chaweng that’s completely decked out with impeccable modern Thai style. And if the beachfront location weren’t enough, top-notch amenities like an outdoor pool, hot tub, spa, and private balconies will keep you coming back for more. Conrad Koh Samui: The ultimate Koh Samui luxury escape. Settled on a private beachfront property spread across 25 acres on the Gulf of Thailand, this 5-star resort serves up some of the island’s best sunsets from the comfort of your villa. Throw in the private infinity pools, a world-class spa, and 5 on-site bars & restaurants and it’s easy to see why Conrad Koh Samui is one of the best hotels in the entire region. Book directly on Hilton.com to get the best price and make your stay eligible for Hilton Honor Points! By air: The only direct flights between Chiang Mai and Koh Samui are operated by Bangkok Airways. For more fare options, you’ll to fly first to Bangkok. Looking for cheap flights to Koh Samui from Chiang Mai? I’d recommend searching for airfare deals on CheapOair! Craving even more relaxation? 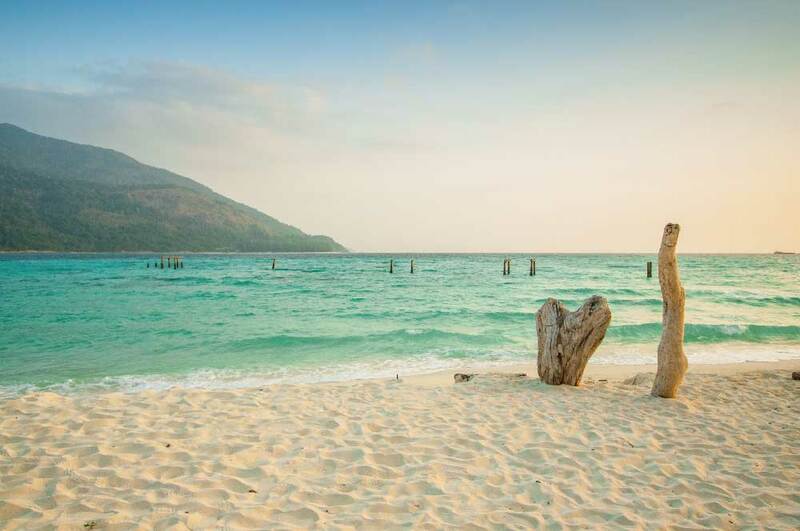 Swap the busier Koh Samui for a smaller and quieter island like Koh Lipe, Koh Tao or Koh Lanta. These harder-to-reach islands are best enjoyed at a leisurely pace. Grab a couple extra days here at the end of your trip if you can. Love trekking? Exchange your surfer shorts for hiking shoes and make your way to Pai in Northern Thailand. Want to party until the break of dawn? Although it’s hardly place I’d personally go out of the way for, there are plenty of things to do in Phuket, a destination most famous for the legendary party culture of its Patong Beach. Hangovers here are not optional. Don’t say I didn’t warn you. 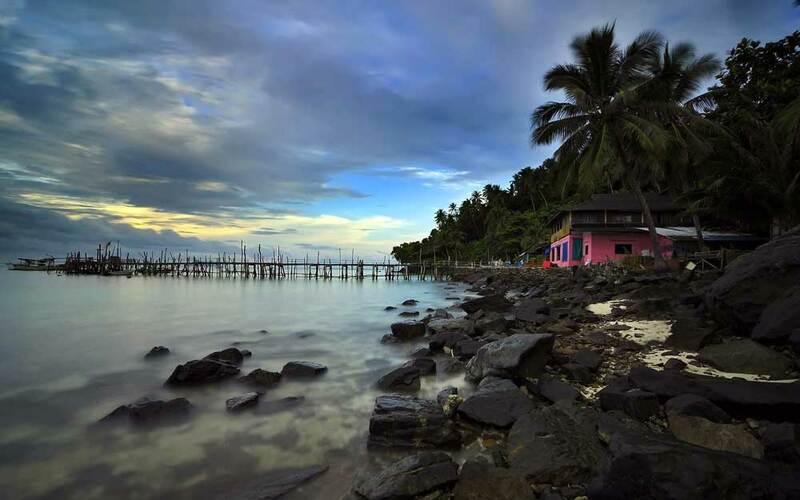 Malaysia: One of Southeast Asia’s most underrated destinations is just a hop-skip-and-jump away from mainland Thailand. Grab a flight to the ever-buzzing Kuala Lumpur to launch your own Malaysia itinerary. Singapore: Even if your wallet doesn’t thank you for continuing on this compact city-state, all of your senses will. Whether you spend one day in Singapore or rev up a longer Singapore itinerary, you’ll love how different an Asian urban experience this little gem of a country really is. Indonesia: Within just a short plane ride from Thailand, you’ll find yourself falling in love with Southeast Asia’s largest archipelago. Get started exploring Indonesia by taking in history and otherworldly landscapes on a Java itinerary or hiking among rice paddies and relaxing by the beach on an unforgettable Bali itinerary. Vietnam: Besides Thailand, there’s perhaps no Southeast Asian country that will hold your attention as much as Vietnam. From the urban delights of Hanoi and Ho Chi Minh to the lovely colonial touches of Hue and Hoi An, there’s no better time to take on a Vietnam itinerary than right now. Cambodia: Blessed with Angkor Wat, perhaps Asia’s most epic monument, there’s hardly any excuse to leave Cambodia out of your Southeast Asia travel plans. Laos: Although still overshadowed by its neighbours, Laos is hardly a slouch when it comes to giving travellers a dose of good fun. 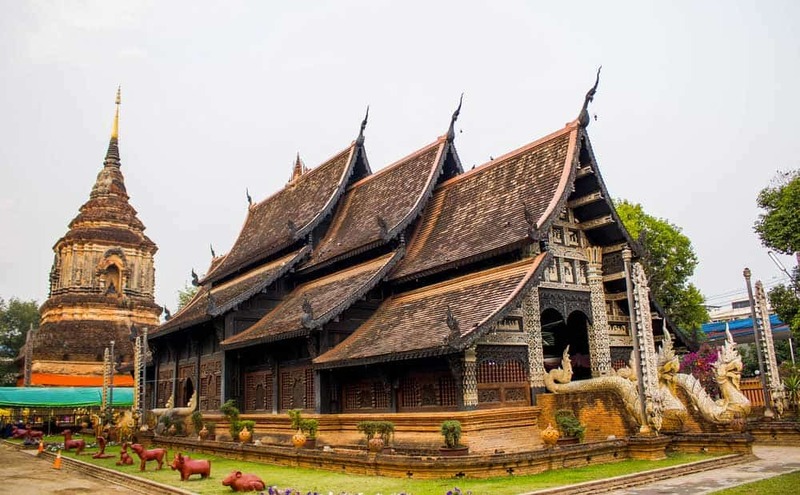 Whether you’ll looking for thrills in the adventure-junkie/backpacker hangout of Vang Vieng or a smattering of cultural bliss in Luang Prabang, hammering out a Laos itinerary will leave you in awe. Hi! I'm Ryan, a Canadian traveller on a mission to help you travel smarter in less time. With over 50 countries under foot, I'm just getting started compiling useful (and unsponsored) travel guides & practical information geared towards part-time independent travellers.